We are excited to introduce the Discover the Bay Program! Since the inception of Mike's Paddle, we have always wanted to share our stoke of paddling in different parts of San Francisco Bay and give people rarely-seen views of iconic Bay Area locations. Transporting a board on your car and searching for places to put-in and take-out can be intimidating and time-consuming, so let us do the work for you! We have chosen three of the best locations for you to experience: Beach and Estuary (L2), Rock Walk (L3), and Treasure Island (L4). Save time, save energy, and see the bay in ways you've never seen before. Discover the Bay with us! Beach and Estuary Tour: 5 miles along the best beach in the bay and heading into the Oakland Estuary between Alameda Island and Bay Farm Island. This tour is serene - perfect for those who just took our level 1 class. This is also a one way trip - we’ll pick you up with a van and trailer and get you right back to the shop in 15 minutes. Rock Wall Tour: 5 miles up the Rock Wall and back, if we have a strong group we’ll go and check out the Aircraft Carriers! Great views of the bay and the city. In 2018 we had 3-5 bottle nose dolphins that regularly hung out by the second section of the rock wall, we hope that they’ll be back in 2019. This tour is great for those who want a little more work out, we’ll ride the current out to the rock wall and come back with the afternoon wind. 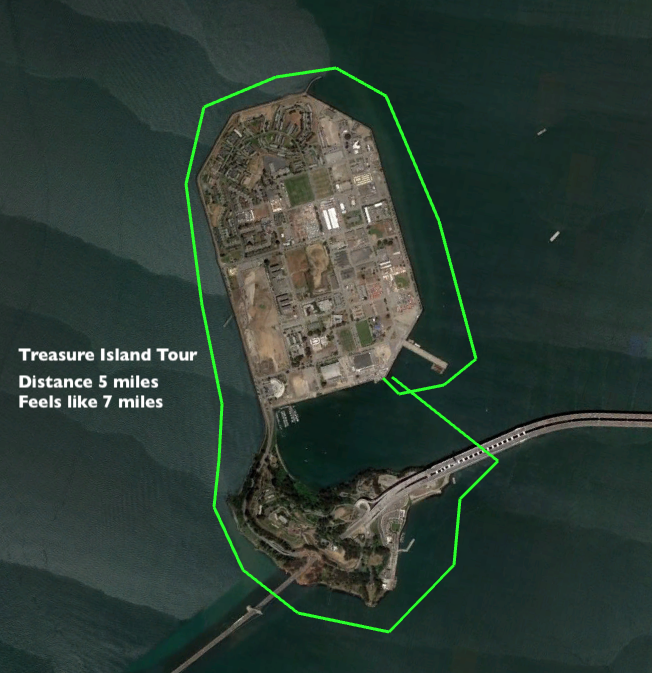 Treasure Island Tour: 5 miles around Treasure Island and Yerba Buena island. This is our most advanced tour which is why we leave it to September and October with minimal wind and current affecting the trip. It can still be quite a paddle since we’ll be paddling under the Bay Bridge on both the east and west span with a lot of boat traffic including tankers. You can’t beat the view of San Francisco, Bay Bridge and the islands though! Because of the advanced conditions, you must complete level 3 before taking this tour. Conditions: Each trip has been designed with optimal tide, current and wind conditions, so that you can enjoy the water. We may cancel due to excessive wind. Even though the distance is similar in all of our tours, because of current and wind conditions, the effort required varies - that’s why we have the “feels like” column. Please note: Each class has a prerequisite that is very firm. If you have equivalent skills, you must be checked out by a staff member on water before signing up for the tour. All necessary equipment is provided. You will receive specific instructions via email before your tour. Simply meet us at the specified put-in ready to paddle!